Another award for team Cogent! On Tuesday, November 24, Cogent Power Inc. was awarded the Leadership Award at the 2015 Ontario Export Awards. The award is given to a finalist that has demonstrated extraordinary leadership and success at being an exporter. The committee has seen the wealth of knowledge and expertise that we can provide to others, and as such, has also asked Ron Harper to lead a webinar to educate other organizations on how to do so. 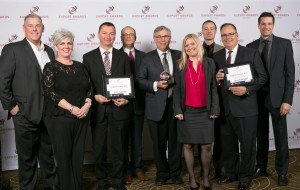 Ron graciously accepted the award on behalf of Cogent Power Inc., and was accompanied by eight Cogent colleagues on this momentous occasion (Lisa Amberman, Matt Stimac, Lauryn Solomon, Frank Guilbault, Andre Simons, Greg Laverdiere, Randy Hayes, and Jeff Riley). Ron has been a dynamic and inspirational leader, who has continued his personal growth by constantly challenging himself to improve in all that he does. As such, he has spent over 20 years researching the best leadership techniques and ideas, and has actively sought to change himself through this process. He believes strongly in developing a world class organization, which consists of individuals who also want to live a better life and be proud of their accomplishments. Under his leadership, Cogent has grown at a rapid pace, and will be launching Cogent College shortly. This is a phenomenal opportunity for individuals to further their own growth, and learn about the strategies that are the foundations of Ron’s success as well. These ideas can be applied to more than just the workplace, and extend to how we interact with others in all aspects of life. Cogent is a highly respected organization, and our growing list of accolades proves that we are leaders in not just our industry, but across the country and internationally, because of the people that make up our team.